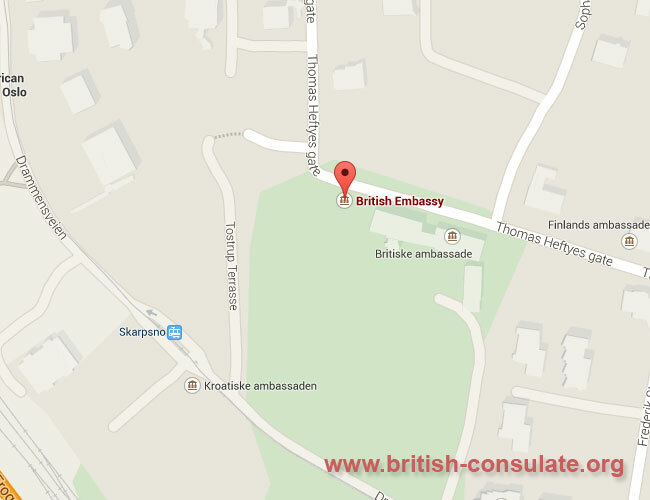 If you are in Norway then you will find the British Embassy in Norway located in Oslo. If you need to register a birth or register a marriage or death then you can speak to the staff at the embassy in Oslo. We have listed the contact details such as the telephone number, email address and a map to the British embassy in Norway. Note the closing times and operating hours of the embassy in Norway. Like everywhere else call the embassy before you visit the embassy. All other sections (Political, Corporate Services, UKTI) are open from 9am to 4pm. Our embassy is in West Oslo between Bygdøy Allé and Drammensveien at Thomas Heftyes gate 8. You can reach us by public transport on the number 13 tram to Skillebekk or the number 30 or 31 bus to Frogner Kirke. Parking is limited around the embassy.